Sea trout are simply brown trout which spend time in the ocean. In spring they follow huge schools of whitebait into the estuaries and lower freshwater reaches of most of the state's rivers and creeks. Some of the best action is conveniently close to Tasmania's major population centres. Hobart has the mighty Derwent as well as the southern rivers (including the Huon, Lune and Esperance). Launceston anglers have the Tamar, North Esk and Great Forester. While on the north west coast there are a number of superb fisheries, including the Mersey, Leven, Forth, Black, Detention, Inglis and Duck. Nonetheless everyone should take the time to visit the West Coast. The remoteness of the area is reason enough - the ancient forests, eerie tea-brown water, and relaxed spirit of a lifestyle which oozes history and friendliness. But more than all that is the undeniable reality that the West Coast offers experiences not quite duplicated anywhere else - very big fish, powerful wild rivers, steep rainforested banks, fishing from snow white beaches. Your first visit will be unforgettable and I wager that it will not be your last. The Arthur is huge and deep and as it is flanked by extensive tracts of dense rainforest access along the banks is all but impossible - serious anglers need a boat. You can motor all the way up the tidal reaches to the first rapid some 26 kilometres from the township at the mouth, thought few anglers bother to go further than the Frankland junction and the very best fishing is in the lowest 6 or 7 kilometres. Barry and Jaynee who operate Arthur River Canoe and Boat Hire at Arthur River township can supply you with an aluminium vee-hull complete with 6 hp motor for $ 100 per day. Their smaller boats are suitable for three adults while the larger ones will seat four. The best time to visit is from September to mid December, with November being the real peak. At this time the sea trout will have come in from the coast to feast on whitebait, bolstering the considerable stocks of river trout. Sea trout typically weigh 1-2 kg though 3 kg are reasonably common. Resident fish weigh anything from 0.5 - 5 kg with fish at the bigger end of the scale being much more common than you might expect. If flows are really low, the tide can be felt all the way up to the first rapid but its influence is greatly subdued during even moderate freshes. Some locals insist that incoming tides are best, though I have had great success drifting flies in currents caused by falling high tides. Really the only big impediments to fishing are the unpredictable and sometimes frequent floods. It pays to contact one of the local businesses a day or so prior to your trip so that you can get a reliable assessment of flow regimes before you leave. While it sometimes takes a day or two for heavy headwater rains to reach the mouth, don't bother leaving home if there has been recent heavy rain in the headwaters. 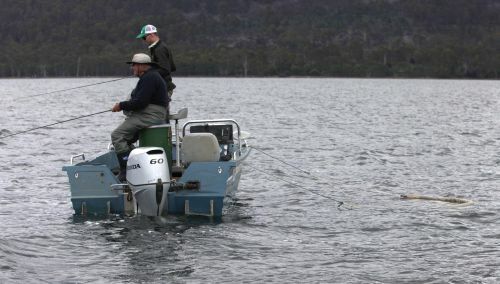 Trolling is the most popular method of fishing with Tassie Devil Cobras being as good as anything else. There is also plenty of scope for spinning from a drifting or moored boat, and this is a deadly tactic when trout can be seen showering the bait beneath the overhanging scrub. Although, polaroiding is usually neigh on impossible, fly fishers usually have ample opportunities for sight fishing, especially when the sea trout and larger river residents are smashing into the whitebait. While the best of the fishing is over by late December, anglers keen to spin up some of those big river residents during summer can usually nail one or two a day. In mild weather you are also bound to find plenty of smaller fish rising to this and that along calm stretches of bank. Interestingly, a number of fine estuary perch have been caught on lures in recent years, some in summer and many well upstream. Almost all of the mid and upper reaches of the Pieman have been inundated by hydro electric dams. Nonetheless, the lower reaches from the heads to the very foot of the Reece Dam offer fantastic springtime sport for sea trout and river resident brown trout. The thing that distinguishes this water from the Arthur is that the flows are heavily regulated by the upstream dams. Flooding is less frequent and more predictable. Generally the river becomes unfishable only after extensive wet periods when the dams have filled to spilling. At the heads there are sedge and bracken flats. Elsewhere the river is flanked by dense wet forest. In the early 1980s a devastating fire ravaged the riverbanks between Corinna and the Reece Dam and even today this area fails to engender quite the same primeval atmosphere that typifies other West Coast rivers. As with the Arthur you really need a boat. The only good launching ramp is at Corinna, a tiny settlement midway between the mouth and the Reece Dam which is now accessible by 2WD road from both Waratah and Zeehan. Public facilities include a good amenities block as well as informal caravan and tent sites. Phil and Diane Polsen, who operate the cruise boat Arcadia ll, offer rugged accommodation in the form of two original buildings from the old gold mining era. There are equipped with gas stoves, generator lighting and hot water. They also hire out 12 foot dinghies complete with 7.5 hp outboards for $ 12 per hour (petrol included, no full-day discount). These are suitable for up to four adults. The best time to fish is October/November and the fishing really tapers off from about mid December onwards. All of the river is well suited to trolling and spinning. Fly fishers usually prefer to hunt around for obvious schools of whitebait and while these can be patchy they are easy to identify - just look for the trout swirling and smashing about. One of the hot spots is the heads (especially from late September until the end of October when fresh bait are entering the river). It also pays to inspect the first and second rapids some 15 to 16 km above Corinna (2-3 km below the Reece Dam). However, you will often find trout throughout the waterway, most notably when they are ambushing bait along the banks amongst the sparse strap weed. The Henty River is unique in that it is the only major river on the West Coast which is well suited to fishing from the banks. If you are interested in this style of fishing, take the sandy 4WD track which heads west from the Henty Road two kilometres south of the Henty Bridge. Some three kilometres later you will arrive at the Backwash, an extensive and idyllic informal camping area. Downstream from here there are kilometres of dunes and beach where you can stalk and polaroid trout as they charge about in the shallows. Boats are best launched at the Henty Bridge on the Henty Road between Strahan and Zeehan. Most trolling and spinning is done in the forested reaches adjacent to the bridge and down as far as the Backwash. The river is quite narrow (in many places you can cast from one side to the other) and It is rightly considered bad form to troll in the dune/beach reaches when anglers are fishing from the banks. The whole of the broadwater from the mouth to the first riffle above the Henty Bridge supports a big population of resident trout. In some areas, such as the weed beds adjacent to the mouth of Badger River, you often encounter lots of very small trout but much bigger fish cruise the edges of the sandy flats and along the forested banks. Fish of 0.5 to 2 kg are typical and others to 5 kg or so can often be seen. It is these big silver/gold resident fish which make the biggest kerfuffle at whitebait time though they are augmented by a relatively modest run of true sea-run fish. While the undisputed peak of the fishing is from late September to mid December more and more anglers are fishing during summer and autumn. The fish are always harder to see once the whitebait are gone but they are still there and will fall prey to the persistent lure or fly enthusiast. Only the very headwaters of the Henty are dammed but the river has never been prone to serious regular flooding. It takes a real deluge to interrupt the fishing for more than a couple of days. The nearest facilities are at Strahan and Zeehan and there is no boat hire service on the river. The Gordon River lies in the heart of the Wild Rivers National Park and is accessible only by boat from Strahan. This involves a 40 kilometre journey over the open tidal waters of Macquarie Harbour so you really need decent runabout or seaworthy dinghy. The only camping area is at the Boom Camp, a large sheet-metal shed capable of sleeping 8-12 people located at Pine Landing (10 km up from the river mouth). 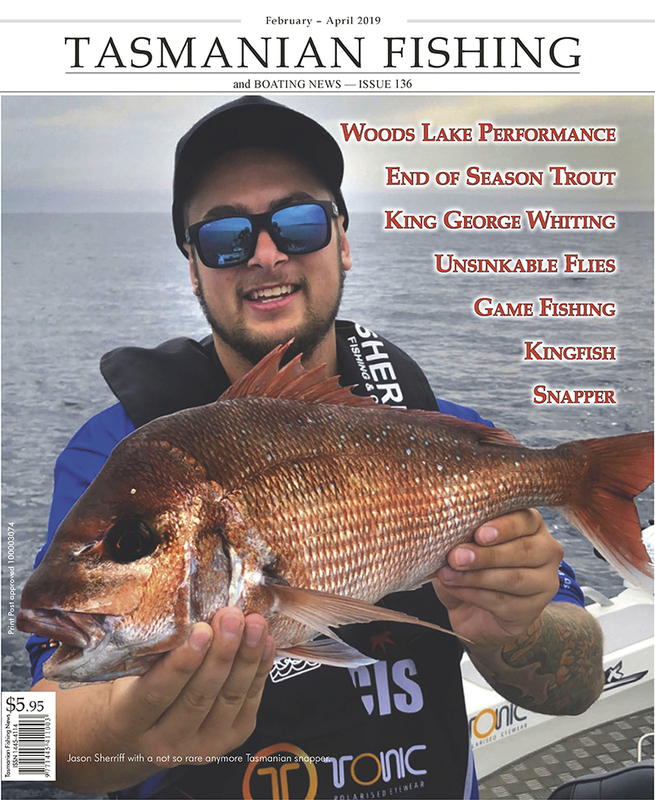 There is no room for fishing from the densely forested river banks and although you can wade the spit from the mouth to Gordon Point (six kilometres into Macquarie Harbour where, incidentally, you will usually intercept plenty of fish) most anglers fish from a boat. While some 40 kilometres of the river is navigable, the best action is centred on the lower reaches from Gordon Point to the Boom Camp. From late September to the end of November you are bound to encounter sea trout and big residents from the harbour and river. At times you will also make significant catches of domestic rainbow trout, escapees from the fish farms in Macquarie Harbour. Trolling and drift-spinning are the most popular fishing methods and traditional spoons and Cobras work as well as anything else. I have always found fly fishing in the Gordon to be less reliable than in the other rivers, though when the whitebait are really on the move the action is as good as you could hope for. Otherwise you generally get good results blind fishing amongst the ribbons of strap weed which line the river banks, or over the flats adjacent to the spit in Macquarie Harbour itself. While the Gordon Dam in the mid reaches of the system regulates much of the natural flow, water from major undammed tributary catchments (including the Franklin and Maxwell) mean that heavy rains result in predictable flooding. Big freshes always make fishing difficult and unpleasant.